Takayuki Hamatsu. Yuzuki Akiyama. Harumi Shuhama. Kazuaki Nagaya. Kazuo Kasahara. 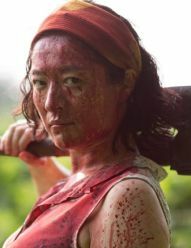 Things go badly for a hack director and film crew shooting a low budget zombie movie in an abandoned WWII Japanese facility, when they are attacked by real zombies. One of the best comedy movies I have ever seen. Not only funny but highly smart as well. This is the best example of low budget movie done right. You don't need millions to make a good movie. All you need is smart plot and decent actors. Like comedies and zombies? DO NOT MISS THIS ONE.